"These students engaged the community in a meaningful way, recognizing their design goals must be practical and implementable. Very thorough and professional looking results." The focus of this studio project was initiated by our instructors. 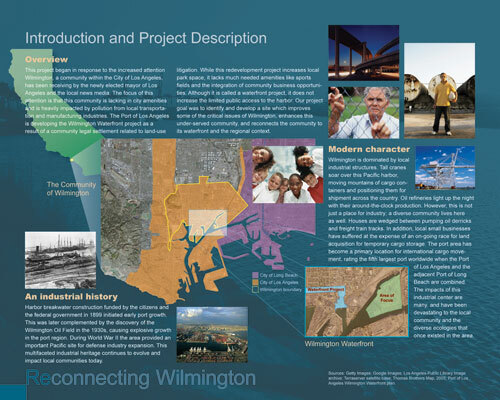 Our class was sent into the community of Wilmington, California to better understand local critical issues, choose a site and develop a project which would meet some of these identified local critical issues and enhance this under-served area. These were the studio goals and objectives, however our own site driven goals were also key to developing a master plan design that benefited the local community. Data was collected from a wide variety of sources and analyzed to relate closely to our project issues. Skills acquired through our basic education in design were utilized throughout the project. During the process of analysis and planning we were fortunate to engage the community, who have carried our information and ideas forward to appeal to local decision makers in order to promote positive change. 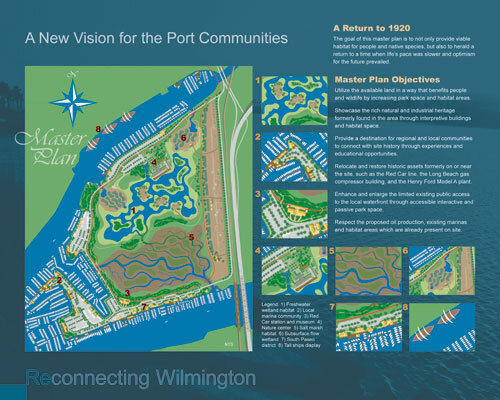 We have worked hard to ensure our master plan ideas are ones which can be realistically implemented. We imagine these ideas would need a multi-disciplinary approach for successful administration and monitoring of the site. This is due to the complexity of some of the suggested remediation systems for soil and water. With nearly 170 acres of industrially impacted land included in this master plan, challenges of this project were numerous. The goals and objectives for this project revolved around providing habitability elements, which are considered basic needs for most communities, into an area long neglected from having such basic needs available. These needs include clean air, water and soil; accessibility to the local water and wildlife; revitalization of local community businesses; open space areas for the public to enjoy; and enhanced educational opportunities for local youths. Although these are considered to be baseline conditions for many areas of the country this is not the case for Wilmington, California. This community of the City of Los Angeles has been transected by cargo movement corridors and impacted by heavy industrialization. In addition, a large portion of the community exists below the poverty line. The idea of meeting goals expected by many communities seem like lofty dreams to this under-served and industrially-influenced community. Data was utilized from a wide variety of resources. Initially conventional census, city data, and area maps helped to pin down both critical issues and the location of our project. 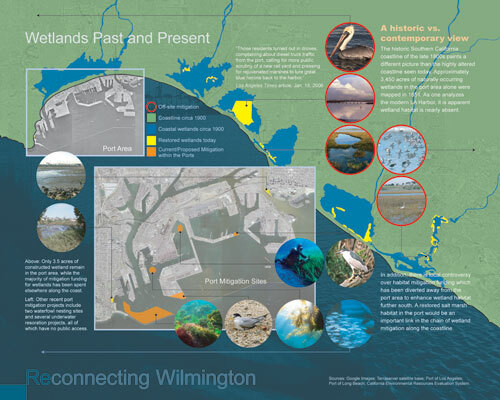 However, very quickly our project took an environmental focus and we began to include data related to regional biodiversity, transportation corridors of the area, urban runoff constituent levels, contaminants found in area dredge material stored on site, and data on local mitigation projects and their success, or lack thereof. Data was also collected on our proposed systems for remediating soil and water contamination issues. This specialized data collection was sometimes a challenge. In some instances the agency in control of the data was not willing to make it publicly available, including data on local water quality and reports detailing sediment contaminants in Los Angeles Harbor. Not only were long hours spent collecting this diverse range of data, but large amounts of time were spent interpreting the information and applying it to our site in a meaningful way. For example, time was spent in understanding which soil and water constituents were a health concern to the environment and the local public. Also in collecting data related to our site, our team spent time learning new skills like the identification of native bird species found on site and gained a better understanding of the impacts that past remediation attempts had on certain portions of the site. 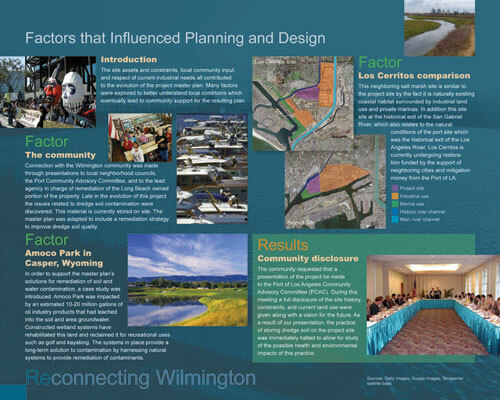 This analysis was very much a multi-disciplinary approach in which our team was very fortunate to have the outside support of our Stormwater Treatment class professor, an individual in a local city planning department, and information provided by a local wildland agency. 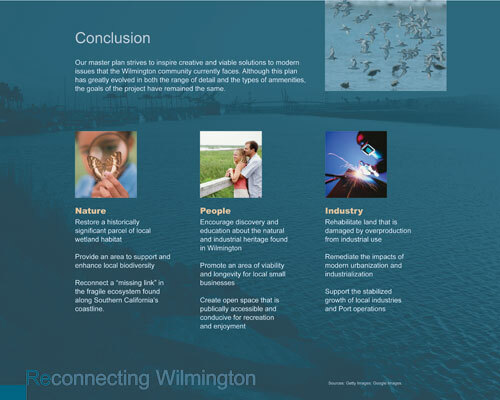 Early on in the project we connected with the local community during an initial Environmental Impact Report (EIR) meeting held in Wilmington. Our team felt it was imperative to attend this meeting and contribute comments to the public session because we noticed inconsistencies in the initial study and the data we were finding. For example the EIR initial study referred to the project site as a man-made island constructed by fill, and the site was not listed as having any biological assets. These facts were in contradiction to our initial inventory data. In addition, the study proposed an end result of filling 123 acres sixteen feet deep and capping the site with asphalt, however there was no disclosure as to where this amount of fill was to originate from. We openly questioned this plan, and asked the agency in charge to disclose where the intended fill material would be acquired. At this time this question has been left officially unanswered; however unofficial sources tell us the fill will originate from ongoing dredge operations in the area. At this meeting we asked if we may present our alternative vision for the site, at that time simply detailed inventory and analysis, and we were granted permission to do so. Also at that point in time is when our team connected strongly with the local community and has maintained this valuable connection. We believe one reason for this strong backing of our vision is our use of case studies. These resources help both the community and local stakeholders to understand that systems suggested are not newly invented, but are in place and functioning well in other areas to treat similar conditions. This case study tool also allowed parties involved to evaluate suggestions based on their merits and without having to debate whether or not a proposal would function as intended. 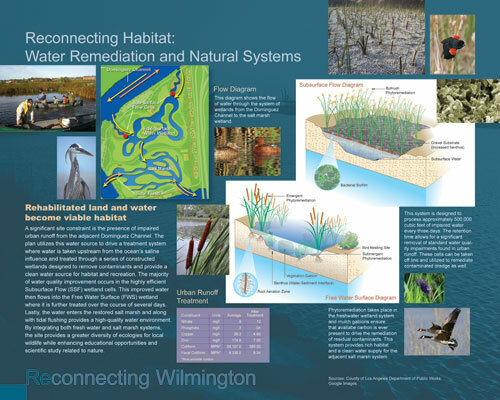 As the project progressed, the case studies became key in promoting solutions for serious environmental concerns, like water and soil remediation. As the ever-increasing circle of support began to grow, we found difficulty in balancing the requested community presentations and continuing the work on our master plan vision. 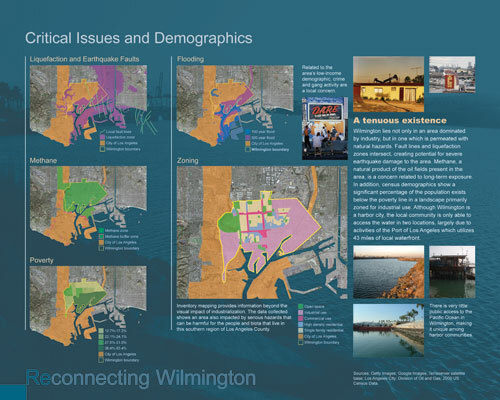 Therefore, we had to limit our presentations to larger community groups like the Wilmington Neighborhood Council and the Port of Los Angeles Community Advisory Committee (PCAC). 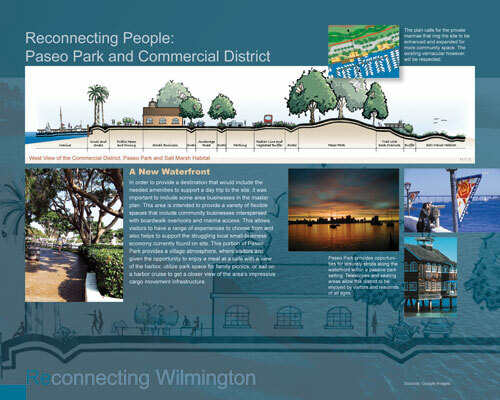 By being selective, yet making digital versions freely available to interested groups, we were able to balance the portion of the project that was academic with the reality of promoting a new vision within the community. This new vision included items influenced by community input. 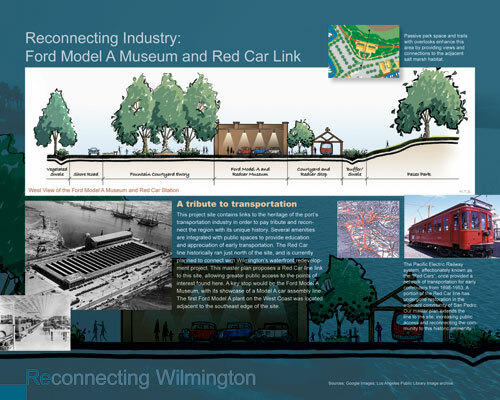 For example, when we initially located the Ford Model A Museum, it was sited in an area that the marina residents felt was important open space needed for maritime business industry. After listening to their land usage needs, we were inclined to agree and relocated our museum. Understanding of area practices also influenced our design. An important example of this is the realization of the vast amounts of contaminated dredge material that was being stored on the site. 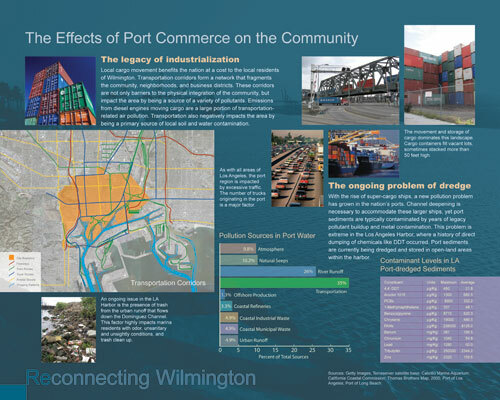 This contaminated dredge material originates from channel deepening projects in the area, in which sediment has been exposed to years of direct dumping of industrial waste into the harbor. Late in the process we adapted a way for our wetland treatment cells to remediate the Class III dredge being brought onshore. Our team believes the input of local residents, and understanding the way land was being utilized on site, pushed our design to adapt to these real life constraints and ultimately allowed us to better plan this 170 acre parcel to meet a wide variety of area needs. Our team imagines this master plan would need to be implemented by a diverse multi-disciplinary approach. This site includes many stakeholders which typically have opinions and interests that conflict with one another. 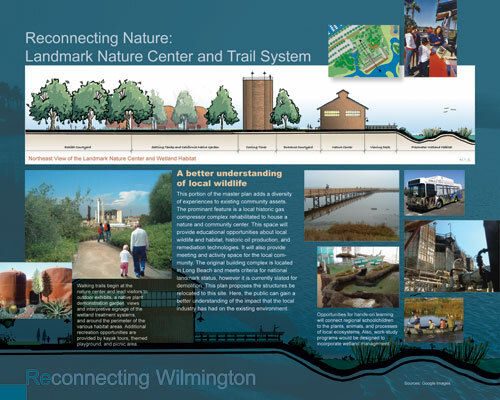 This is to be expected in a master plan that combines both habitat and contamination issues. 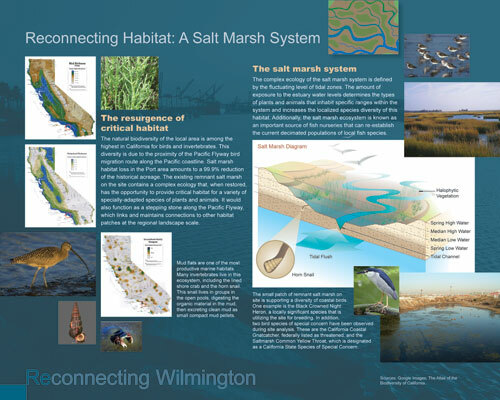 The community is involved because they want to protect their access to the water and desire more open space. In order for this type of plan to be successful, more than one party's needs have to be met. This would require compromise on the part of many, which is not easily done with so many diversely interested parties involved. 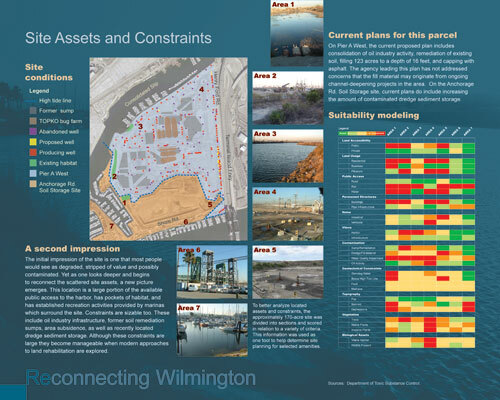 Increased attention on this project includes a feature article in the local paper, and the Port of Los Angeles Board of Harbor Commissioners has stepped in to question the dredge movement practice that has been occurring on site. Our team has worked hard to provide a plan that could be implemented in this community, and fortunately a good portion of funding for a project like our proposal has been set aside by the Port of Los Angeles in community aesthetic mitigation funds. This project would be complex to administer. This is primarily due to the fact the parcel is owned by two entities. The Port of Los Angles controls the area below the high tide mark and the marinas. The City of Long Beach owns the greater 123 acre portion of the property. In order to administer a master plan such as this, the owners would either have to take responsibility for a portion of the plan or create a joint power to implement the master plan as a whole. 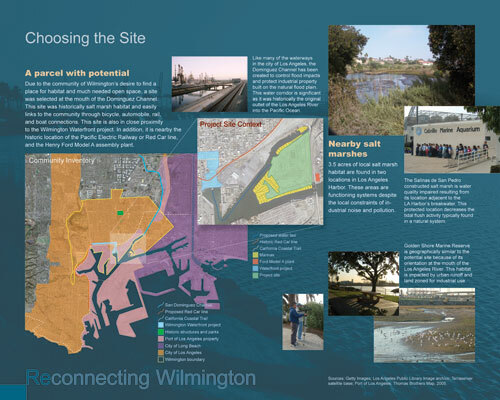 Due to the complexity of remediation and establishment of habitat areas, monitoring would most likely come from local advisory groups and the various agencies who work in the Los Angeles Harbor. Although this plan has greatly evolved to include a wide range of detail and the many types of amenities, the goals have remained consistent. 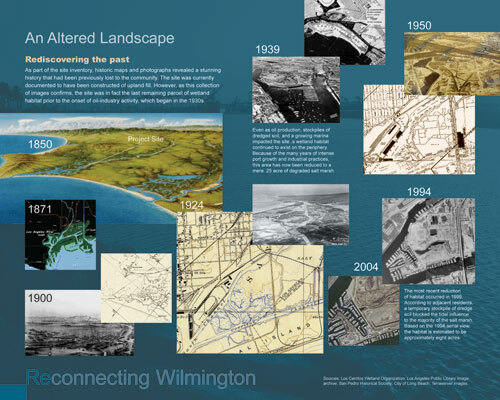 These are to restore a portion of the area's ecological history, to provide a place for the community to connect with and learn about the area's diverse historical heritage, and to remediate the ongoing effects of the surrounding industrial infrastructure. Our team recognizes the fact that in order to resolve the larger issues of this site an intensive multi-disciplinary approach needs to be undertaken. We feel the profession of landscape architecture is uniquely poised to lead the way in coordinating a new master plan for this area. Our profession has the skill and broad knowledge to look beyond what presently exists on a site like this, perform accurate research, and then graphically represent suitable alternatives that meet the needs of a wide range of stakeholders. Through projects like this, the profession will be able to grow and lead the way into a future that can affect positive change in influencing the implementation of techniques to resolve difficult urban and industrialization effects, while providing amenities to enhance communities.